Today there has been widespread media coverage of the launch of the new UK Climate Projections 2018. This morning, Sky News, Telegraph, BBC News, the Times, Daily Mail, Mirror Online and Business Green previewed a speech given by the Environment Secretary, Michael Gove at the Science Museum in London, in which he launched new data giving the most detailed picture yet of temperature, rainfall and sea level rise over next century. Using the latest science from the Met Office and around the world, the UK Climate Projections 2018 (UKCP18) illustrate a range of future climate scenarios until 2100 – showing increasing summer temperatures, more extreme weather and rising sea levels are all on the horizon, and that urgent international action is needed. Average summer rainfall could decrease by up to 47 per cent by 2070, while there could be up to 35 per cent more precipitation in winter. Sea levels, for example - which we are becoming more accurate at measuring, thanks to advances in instruments and monitoring systems. In the 20th century the oceans rose around 15cm and the rate of increase has since quickened. Just since 2000, levels have risen around six centimetres, based on a global-average rise of 3.2mm a year. Our seas are storing increasing amounts of heat: around half of all ocean warming has occurred since 1997. Even as we take action to slow carbon dioxide pollution now, physics dictates that the climate will keep heating up for decades to come. Since 1990 we have cut emissions by 42 per cent – faster than any other G7 nation – and our economy has grown by two-thirds. Tackling climate change is not a binary process which requires us to champion the planet over national prosperity. 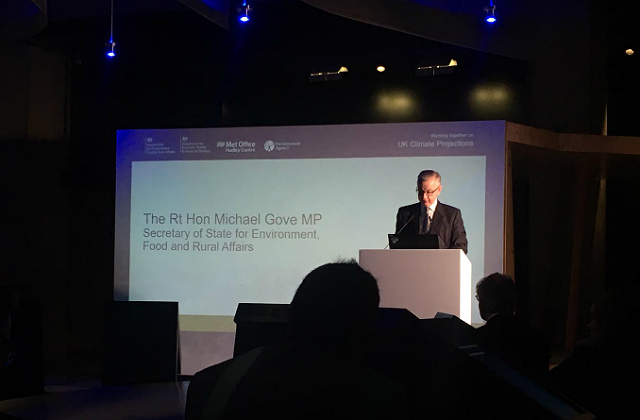 During the speech, the Environment Secretary announced £13 million for mangroves restoration to support projects in small island states, highlighting their importance in climate mitigation. The Environment Secretary also announced a new strategy and taskforce to improve the condition of peatlands in England in 2019, and also laid out plans for a consultation on a new English Tree Strategy which will complement progress being made through Countryside Stewardship and the Woodland Carbon Guarantee scheme towards the target of planting 11 million new trees during the current Parliament. With climate change a global challenge, for the first time, UKCP18 presents international projections, allowing other nations to use this data to gauge future risks for food supply chains, or check rainfall projections for the likelihood of localised flooding. When it comes to climate change we now, thanks to the efforts of the UK’s scientists know more than ever before the urgency of acting. Which is why not just I, but future generations, are so much in the debt of scientists who work for a better future.